Judges: Elaine Feinstein and Stephen Romer Prize: �1,500; Closing date: 31 May 2009 The Corneliu M Popescu Prize for European Poetry Translation 2009 is open to collections of poetry published between 1 June 2007 and 31 May 2009 which feature poetry translated from another European language into English. 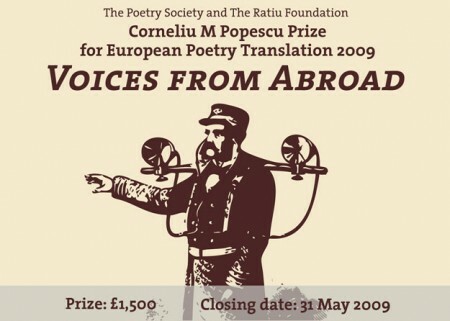 The Corneliu M Popescu Prize for European Poetry Translation is a wonderful opportunity to travel through Europe�s amazing landscapes and cultures. This biennial prize has previously celebrated the stormy political and cultural landscape of Germany, with David Constantine�s translation of Hans Magnus Enzensberger�s Lighter than Air; the melancholy of the human condition viewed by Marin Sorescu with distinctly Romanian irony in The Bridge, translated by Adam J Sorkin and Lidia Vianu; and rich Estonian folksong traditions, with Kristiina Ehin�s The Drums of Silence, translated by Ilmar Lehtpere. The Prize is named after Corneliu M Popescu, translator of the work of one of Romania�s leading poets, Mihai Eminescu, into English. Popescu was killed in the violent earthquake of 4 March 1977, aged 19. The Prize was initiated in the early 1980s by Ion Ratiu, the well known Romanian politician, businessman, philanthropist, champion of democracy, and supporter of the arts. In his memory we are launching this year�s competition on 17 January 2009, the ninth commemoration of his passing away. Submissions should be sent to Translation Prize, The Poetry Society, 22 Betterton Street, London, WC2H 9BX. Three copies of each book should be sent and the original language(s) of the poems should be specified. For more information call +4420 7420 9892 or email gttoouli@poetrysociety.org.uk . Elaine Feinstein is a poet, novelist, short-story writer, playwright, biographer and translator. She was born in 1930 in Bootle, Lancashire. Elaine Feinstein�s first volume of poetry, In a Green Eye, was published in 1966. Her later work has been influenced by the poetry of Marina Tsvetaeva, a poet whose work she has translated from the Russian. She is also the author of several biographies and novels, her most recent being The Russian Jerusalem (2008). She lives in London and is a fellow of the Royal Society of Literature. Her most recent poetry collection is Talking to the Dead (2007), dedicated to the memory of her husband, Arnold. Stephen Romer was born in Hertfordshire in 1957, and is a lecturer at the University of Tours in France. He has also been Visiting Professor in French at Colgate University, New York. His own poetry collections include Idols (1986); Plato�s Ladder (1992); and Tribute (1998). He has translated many French poets, including Philippe Jaccottet, Jean Tardieu, and Jacques Dupin. He has also translated sections from the Notebooks of Paul Val�ry (2002). His latest collection of poetry is Yellow Studio (2008), shortlisted for the 2008 T. S. Eliot Prize. Stephen Romer is also the editor of 20th Century French Poems (2002). The Ratiu Foundation was established in London in 1979 by Ion and Elisabeth Ratiu to promote and support projects which further education and research in the culture and history of Romania. This year, the Foundation celebrates 30 years of the fight for independent thought and cultural excellence. The Ratiu Foundation offers 100 annual grants, principally for postgraduate courses. The Ratiu grants are awarded to Romanian students to study a wide range of subjects in the UK. The Ratiu Foundation also offers annual seed funding for innovative projects, which foster Romanian arts and civilisation, heritage, civil society, democracy, and environmental protection. Ion Ratiu (6 June 1917 - 17 January 2000), distinguished Romanian diplomat, entrepreneur, publisher, writer and humanitarian, was an outspoken critic of the communist regime in Romania during the 1947-1989 period. He devoted his life to the fight for democracy in Romania and its integration into the Euro-Atlantic structures. More details on www.ratiufamilyfoundation.com . The Poetry Society celebrates its centenary in 2009. It is one of Britain�s leading arts organisations representing poetry both nationally and internationally. To anyone who reads, writes or enjoys poetry, the Poetry Society can open up the global world of poetry. Its key publication, Poetry Review, puts you at the heart of what�s happening in contemporary poetry. The Poetry Society co-ordinates the National Poetry Competition and the Foyle Young Poets Award; both have a worldwide reputation for discovering poetic excellence. Anyone who becomes a member enjoys many benefits including the opportunity to become part of poetry network Stanzas, which establish links with local poetry scenes. To find out more about the Poetry Society and what�s happening in its centenary visit www.poetrysociety.org.uk. Note: Illustration above inspired by an original image from Scientific American, 1880, showing Professor Mayer's topophone, an instrument for estimating the direction of sound.